A whiter, brighter smile makes you look good and feel great. Unfortunately, stubborn stains can get in the way of the dazzling smile you deserve. You can blame most of these stains on the foods you eat and the beverages you drink, but you don’t have to live with the pain of stains. Today, there are many ways to prevent pesky staining and make your teeth look their whitest, from knowing which foods can cause or cease staining to exploring teeth whitening either at home or from an affordable dentist. All you need is a little knowledge and a dentist in Philadelphia to keep your teeth at their brightest and best. Not surprisingly, dark-colored foods and beverages are most likely to stain your teeth. This includes many favorites like coffee, tea, red wine, soda, cranberry juice, blueberries, beets, tomato sauce and soy sauce. But you don’t need to avoid them completely. Just be sure to brush your teeth or rinse your mouth well after enjoying them to help wash away their dark dyes. Yet what is surprising is that some common foods can actually help prevent staining. These stain-stopping foods include apples, carrots, celery, cauliflower, and hard cheeses. Simply chewing these foods gently scrubs your teeth and produces the saliva that neutralizes acid and cleans your mouth. In the spirit of prevention, there are a number of ways to protect and preserve the whiteness of your teeth. First, good dental care can do wonders for whiteness. Twice-a-day brushing, flossing, and rinsing with an antibacterial mouthwash can help fight the plaque that holds onto stains. 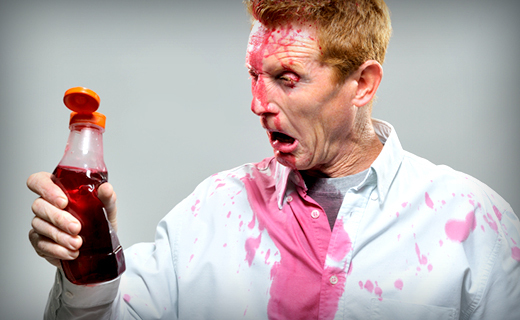 Next, use a straw when drinking dark-colored beverages to stop the liquid from staining the front surfaces of teeth. Also, try not to smoke because tobacco causes teeth staining and yellowing. Most importantly, get your teeth professionally cleaned at least twice a year. A dental hygienist can remove stubborn stains to make teeth look naturally brighter, so be sure to schedule regular cleanings with your dentist in Philadelphia. If these simple steps don’t remove your stains as much as you’d like, teeth whitening can give you the white you want. Teeth whitening works well on teeth that are stained, yellow, brown or gray but it’s a process that must be done carefully and correctly or it can permanently damage the enamel on your teeth. You should talk to your dentist in Philadelphia to see if teeth whitening is right for you and discover which options are best. If you want to whiten at home, the easiest and least expensive way is to use a whitening toothpaste. Whitening toothpastes contain gentle polishing agents that remove stains better than traditional toothpastes. Since these products are available over-the-counter, they do not whiten as well as professional treatments. 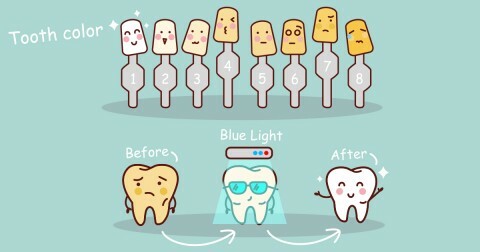 Most whitening toothpastes can lighten teeth by one shade, while professional whitening can make teeth between three and eight shades lighter. Another at-home option is teeth whitening rinses. These rinses help reduce plaque, fight gum disease and freshen your breath like mouthwashes, but they also contain bleaching agents that whiten your teeth. While these products are inexpensive and easy to use, they are not as effective as other teeth whitening treatments because they are only in contact with teeth for a few minutes each day. The strongest at-home treatment is over-the-counter teeth whitening kits. These are available as gels, strips or trays and they whiten by placing a peroxide-based whitening gel directly onto teeth. These must be used every day for a few weeks in order to achieve the whitest results. While their great convenience and low cost make these products very appealing, many people get frustrated because they don’t always evenly whiten all teeth. For the whitest and fastest results, professional teeth whitening is the way to go. For this process, a whitening solution is applied directly to the teeth by a dentist or dental hygienist. Sometimes, special lights and lasers are used to enhance the whitening process. Dramatic results can be seen after only one treatment, but several visits are usually needed. While this professional process offers the most whitening in the least amount of time, it is also the most expensive, so you need to find an affordable dentist who can meet your needs and your budget. A whiter smile can completely change your appearance and your confidence, so it’s important to know how to keep your teeth in their best and brightest condition. By having good dental habits, being smart about foods and drinks, and using teeth whitening methods that suit your needs, you can easily have whiter and brighter teeth that make you smile. To find an affordable dentist in Philadelphia to make your smile its whitest, call Gentle Dental of Pennsylvania today at (215) 789-9675 or make an appointment.